Plumeria are a tropical flowering tree, sometimes called frangipani or temple tree, in the plant family Apocynaceae. It is the famous Hawaiian lei-flower.Plumeria trees can be found growing in the tropical zones of Florida, Hawaii, Texas. From Mexico and Central America, Plumeria has spread to all tropical areas of the world, especially Hawaii, where it grows abundantly. 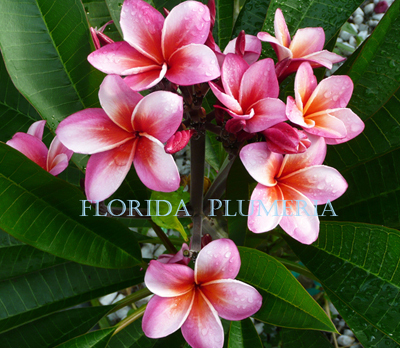 Plumerias are becoming increasing popular with collectors in the U.S., Australia, and Thailand where new hybrids are being released at breakneck speed. Plumeria is a small genus of 7-8 species native to tropical and subtropical Americas. The genus consists of mainly deciduous shrubs and trees. P. rubra (Common Frangipani, Red Frangipani), native to Mexico, Central America, and Venezuela, produces flowers ranging from yellow to pink depending on form or cultivar. Plumeria is related to the Oleander (very common in Florida), and both possess poisonous, milky sap. Each of the separate species of Plumeria bears differently shaped leaves and their form and growth habits are also distinct. The leaves of P. alba are narrow and corrugated, while leaves of P. pudica have an elongated oak shape and glossy, dark green color. P. pudica is one of the everblooming types with non-deciduous, evergreen leaves. Another species that retains leaves and flowers in winter is P. obtusa; though its common name is “Singapore”, it is originally from Colombia. Tree height and width can reach 20 feet. Plumeria flowers are most fragrant at night in order to lure sphinx moths to pollinate them. The flowers have no nectar, and simply dupe their pollinators. The moths inadvertently pollinate them by transferring pollen from flower to flower in their fruitless search for nectar. “Plumeria” species are easily propagated by taking a cutting of stem tips in Spring and allowing them to dry at the base before inserting them into soil. They are also propagated via tissue culture both from cuttings of freshly elongated stems and aseptically germinated seed. The genus, originally spelled Plumiera, is named in honor of the seventeenth-century French botanist Charles Plumier, who traveled to the New World documenting many plant and animal species. The common name “Frangipani” comes from an Italian noble family, a sixteenth-century marquess of which invented a plumeria-scented perfume. In several Pacific islands, such as Tahiti, Fiji, Hawaii, Tonga and the Cook Islands Plumeria is used for making leis. In modern Polynesian culture, it can be worn by women to indicate their relationship status – over the right ear if seeking a relationship, and over the left if taken. P. alba is the national flower of Nicaragua and Laos, where it is known under the local name “Sacuanjoche” (Nicaragua) and “Champa” (Laos).